At Southwest Greens of the Valley in Scottsdale, Arizona, we’re the pros at proper design, spacing and placement of your personalized synthetic grass putting green. 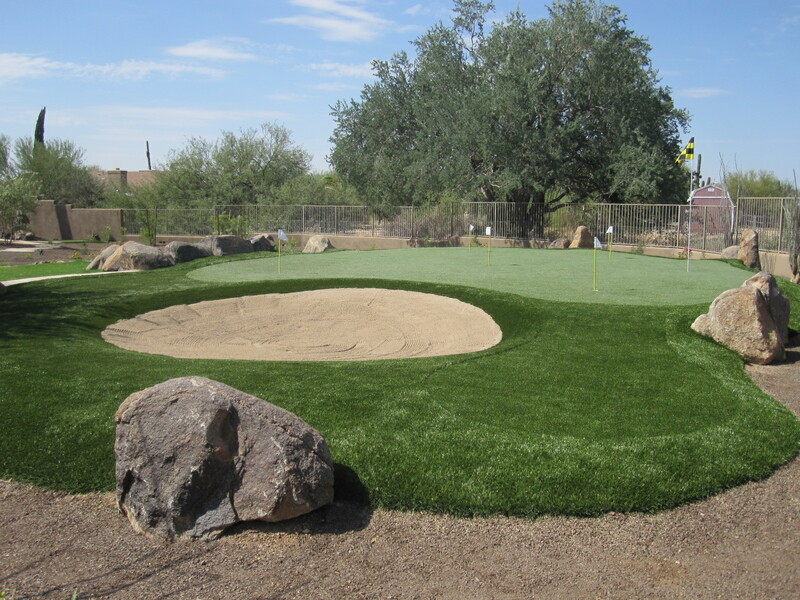 We like to install approximately one putting green cup per 100 square feet, so each hole does not interfere with the others. Chip right up and pick a cup! We like to set the cups so the undulations will give you all types of putts: left to right break, a right to left break, maybe a little uphill putt, a downhill putt and, most importantly, the long straight putt. We also offer a smaller 3 inch diameter practice cup which, if you can make that putt, the large cup starts to look like a basketball hoop! Invite us over to your home or office to discuss the possibilities of your custom putting greens from Southwest Greens of the Valley. Just use your imagination and we can build it! For your complimentary consultation please call us today at 480-664-9414 or click here: contact us.